The 32nd Air Refueling Squadron, sometimes written as 32d Air Refueling Squadron, is part of the 305th Air Mobility Wing at Joint Base McGuire-Dix-Lakehurst, New Jersey. It operates the KC-10 Extender aircraft conducting air refueling missions. The squadron is one of the oldest in the United States Air Force, its origins dating to 19 May 1917, being organized at Kelly Field, Texas. The squadron deployed to England as part of the American Expeditionary Force during World War I. During World War II, the squadron saw combat service as a B-17 Flying Fortress unit, assigned to the Fifteenth Air Force in Italy. During the early years of the Cold War, it was an RB-47 Stratojet Strategic Reconnaissance Squadron as part of Strategic Air Command (SAC). On 11 August, orders were received for the 32d to deploy to France. The 30th to 37th Aero Squadrons were sent as a group to Fort Totten, New York, and embarked on the RMS Baltic on 23 August for their trans-Atlantic voyage. They arrived on 15 September at Liverpool, England, where 50 men of the group were selected to remain to train for aircraft mechanic instruction with the Royal Air Force. The balance of the squadron were ordered to Le Harve, France, arriving on 18 September. There most of the men of the group were sent to various French aviation schools for training to maintain French aircraft. The remainder of the group was designated as the 32d Aero Squadron and sent to the new Issoudun Aerodrome in Central France. There the squadron was engaged in construction activities, building roads, barracks and hangars for what was designated as the 3d Air Instructional Center. The 32d Aero Squadron remained at Issoudun Aerodrome for the balance of the war, engaging in construction activities at the facility as it grew and expanded. By the end of the war, the complex had grown to fifteen different airfields, all with support buildings and facilities. In November 1918, the 32d was reassigned to the Third Army Air Service, being moved to Trier Airdrome, in the Rhineland of Germany to repair the facility for use by the Air Service. In early January 1919, orders for demobilization were received and the squadron moved to a Base Port at Bordeaux, France for the return voyage back to the United States. It remained at the base camp until March, when it finally sailed for New York, arriving at Mitchel Field about 5 April. There the men of the 32d Aero Squadron were demobilized and returned to civilian life. The squadron was itself demobilized formally on 14 April 1919. The squadron was reconstituted in the Army Air Service as the 32d Bombardment Squadron on 24 March 1923. It was assigned to the 7th Bombardment Group. however it was not organized or activated until 24 June 1932 when it was assigned to the 19th Bombardment Group at Rockwell Field, San Diego, California. The 32d was equipped with Keystone B-3 bombers. It was moved in 1935 along with the group to the new March Field, near Riverside, where it received a mix of Martin B-10 and B-12 monoplane bombers. In the late 1930s, the 32d received B-18 Bolo medium and early model YB-17 Flying Fortress heavy bombers. In 1940, it received the new B-17B Flying Fortress, the first production version of the B-17. The squadron was reassigned to Albuquerque Army Air Base, New Mexico on 4 June 1941. Its purpose was to train air and ground crews for reconnaissance and bombing duty with the B-17 before deployment to Clark Field in the Philippine Islands. On 23 November it moved to Hamilton Field, California to stage for its subsequent movement to Clark Field. It was at Hamilton Field on 7 December 1941 during the Pearl Harbor Attack. Upon the outbreak of World War II, the 32d moved to Muroc Army Airfield, its mission was antisubmarine patrols along the Southern California coast. On 16 December it was attached to the provisional Sierra Bombardment Group, where it mission was antisubmarine patrol duty. However, as conditions in the Philippines worsened, the Air Echelon B-17s departed via Hawaii on 17 December. Upon arrival at Hickam Field, the aircraft were pressed into service for defensive reconnaissance patrols around the Hawaiian Islands. The Ground Echelon at Muroc was concurrently dissolved and personnel assigned to other units. Fully bombed up, B-17F 42-5145 the 32d Bomb Squadron was photographed en route to Viterbo Airfield, Italy on 29 July 1943. Assigned to the group seven months earlier, this aircraft had completed 62 missions by the time It was transferred on to the 86th BS/2 BG in Nowernber 1943.Having passed the 100-mission mark, 42-5145 was lost on its 102nd combat sortie when It was shot down by German fighters over Fedora, Italy, on 11 March 1944. Six crewmen baled out. The squadron was reformed in the United States in March 1942, by a redesignation of the newly established 354th Bombardment Squadron; trained under Second Air Force. Flew antisubmarine patrols off the California coast from, late May–early June 1942, then over the Mid-Atlantic coast during June–July 1942. Deployed to European Theater of Operations (ETO) in August 1942, being assigned to VIII Bomber Command, one of the first B-17 heavy bomb squadrons assigned to England. Engaged in strategic bombardment operations over Occupied Europe, attacking enemy military and industrial targets. Reassigned to Mediterranean Theater of Operations (MTO) as part of Operation Torch invasion of North Africa. Operated from desert airfields in Algeria and Tunisia during North African and Tunisian campaign. Assigned to Northwest African Strategic Air Force during Invasion of Sicily and later Italy in 1943. Allocated to Fifteenth Air Force for strategic bombing of Nazi Germany and occupied Europe. Attacked enemy targets primarily in the Balkans; Southern France; Southern Germany and Austria from southern Italy; engaged in shuttle bombing missions to airfields in the Soviet Union during the summer of 1944. Personnel largely demobilized after German capitulation in May 1945; squadron reassigned to the United States and was programmed for conversion to B-29 Superfortress operations and deployment to Pacific Theater, plans canceled after Japanese capitulation in August 1945. Aircraft sent to storage and unit inactivated largely as a paper unit in October 1945. Reactivated in 1946 as a Strategic Air Command B-29 squadron. Deployed to Furstenfeldbruck AB, Germany, July–August 1948; to RAF Station Scrampton, England, October 1948-January 1949; and to RAF Stations Lakenheath and Sculthorpe, May–November 1950 for "show of force" missions in Europe as a result of the Berlin Blockade by the Soviet Union and rising Cold War tensions in Europe. 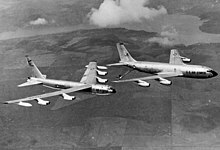 Equipped in 1953 with B-47 Stratojets; the squadron trained with electronic countermeasures from 1958–1964. In 1965 the squadron was redesignated 32d Air Refueling Squadron and assumed the mission, personnel and equipment of the 321st Air Refueling Squadron, which was simultaneously inactivated, at Lockbourne Air Force Base. The unit performed air refueling operations worldwide from 1965–1979 and since 1981. From c. 10 June–8 October 1972, all personnel and aircraft were on loan to units in the Pacific or other Strategic Air Command units, leaving the squadron unmanned. It deployed most aircraft and personnel to Southeast Asia October–December 1972, in support of Operation Linebacker II. It again deployed aircrews and tankers to various locations for air refueling support in Southwest Asia from August 1990–April 1991. The 32d received the first KC-10A delivered to the Air Force, at Barksdale AFB, on 17 March 1981. ^ The squadron is not related to a 32d Air Refueling Squadron, Heavy that was constituted the same day and assigned to Strategic Air Command for activation on or about 8 March 1965. This action was retroactively revoked in November 1965 and the 32d Bombardment Squadron was redesignated as the 32d Air Refueling Squadron. AFOMO Letter 346n, 23 December 1964, Activation of the 32d Air Refueling Squadron, Heavy and Certain Other USAF Unit Actions. AFOMO Letter 481n, Amendment to AFOMO Letter 346n, 23 Nov 1965. ^ a b c d e f Kane, Robert B. (November 4, 2010). "Factsheet 32 Air Refueling Squadron (AMC)". Air Force Historical Research Agency. Archived from the original on June 15, 2017. Retrieved February 1, 2018. Gorrell, Col. Edgar S. (1974). History of the American Expeditionary Forces Air Service, 1917-1919. Series E. Volume 7, History of the 28th, 30th-37th, 41st and 43d Aero Squadrons. Washington, DC: National Archives and Records Service, General Services Administration. OCLC 215070705. Hallion, Richard P. (1994). "The Battle Against the U-Boat in the American Theater" (PDF). Air Force Historical Research Office. Retrieved 23 February 2017. Mitchell, John H. (1990). On Wings We Conquer (In Alis Vicimus) [sic]: the 19th and 7th Bomb Groups of the United Stares Air Force [sic] in the Southwest Pacific in the First Year of World War Two. Gem Publishers.